Simchat Torah, Hebrew for “rejoicing in the Law”, celebrates the completion of the annual reading of the Torah. Simchat Torah is a joyous festival, in which we affirm our view of the Torah as a tree of life and demonstrate a living example of never-ending, lifelong study. Our Torah scrolls are taken from the ark and carried or danced around the synagogue seven times. 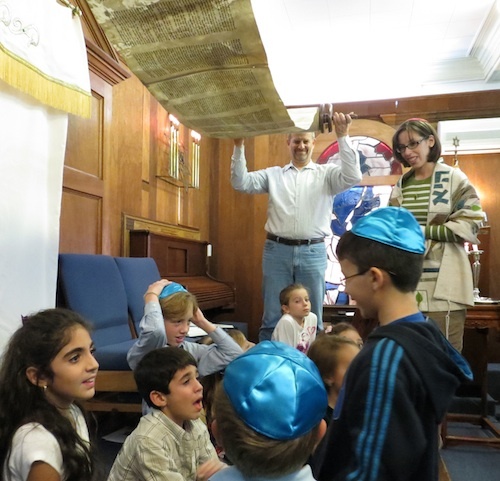 Anyone past bar or bat mitzvah age can carry the Torah and many of our congregants get a turn to experience the joy of carrying the Torah. During the Torah service, the concluding section of Deuteronomy is read, and immediately following, the opening section of Genesis, or B’reishit as it is called in Hebrew, is read. In addition, at our temple, consecration of religious school students is performed at the Simchat Torah service.